In a positive sign for homebuyers planning on taking out new mortgages, the Federal Reserve sent its clearest signals yet that it will hold off on interest rate increases for the foreseeable future and perhaps the rest of 2019. However, other macroeconomic risks laid out by Fed Chairman Jerome Powell in a post-meeting press conference March 20 may send jitters throughout the financial market that could ultimately create a new drag on home sales. In a document known as the “dot plot,” released at the conclusion of each bi-monthly Fed meeting to aggregate the central bank’s collective interest rate projections, a majority of the board of governors (11 out of 17) did not foresee any rate hikes this year. That marked a stark shift from December 2018, the last time the Fed raised rates, and when all but two members of the bank’s rate-setting body projected an average of three hikes in 2019. Combined with other factors, this should keep mortgage rates from growing for now, and may even bolster the downward trend in rates that started late last year. The Fed controls the federal funds rate, which in turn plays a major role in the rates lenders charge to consumers on a host of credit types, from mortgages to auto loans. Low rates tend to benefit the real estate sector. According to the Wall Street Journal, real estate stocks received a noticeable boost in response to the news that rates would probably remain unchanged for the next several months. However, by the end of the day, the Fed’s decision seemed to have instilled more fear than hope in the economy overall. 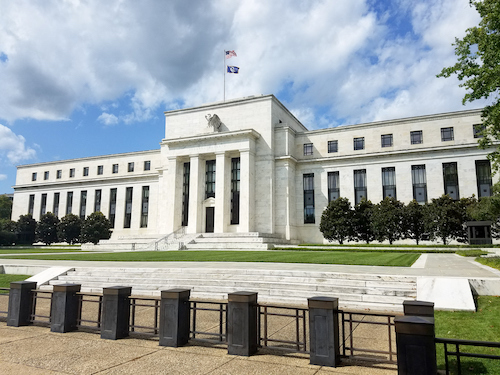 Because the Fed changes interest rates to influence economic activity, its decision not to raise rates could be seen as confirmation that the U.S. economy is entering a rough patch. The Fed generally aims to raise rates when the economy is growing, in order to control inflation, but lowers rates to encourage borrowing when growth slows. While Powell and other economists don’t currently see a case for a rate cut in response to a serious financial downturn, the sluggish housing market has bolstered the case against higher rates. Financial malaise in China and Europe has added to stress on the American economy. As in his last two press conferences, though, Powell played down the negative risks to the economy while advocating for a sense of cautious optimism across the board. “The reason we’re on hold is that we think our policy rate is in a good place, and we think the economy is in a good place, and we’re watching carefully as we see these events evolve around the world and at home,” Powell said during the press conference.